The feast of Christmas is in sight once again to remind us of the love and philanthropy of the worshipped in Trinity God. The Only-begotten Word of God takes on flesh ‘through the Holy Spirit and the Virgin Mary’ and is born in Bethlehem of Judea. The Magi from the East are led by the Star and visit the holy manger, in which the divine Child was wrapped in swaddling clothes, ‘because there was no guest room available for them’ (Luke 2.7). The Angels in heaven chant the hymn of joy, peace and that blessed Hope with which the God-man Christ enriched the world: ‘Glory to God in the highest, and goodwill to all men.’ (Luke 2.14). We thus celebrate this divine chronicle and commemorate the Event that changed the course of human history. God’s peace was brought to divided humanity, and opposites were reconciled. Both Jews and Gentiles were given the opportunity to reunite with Christ, who united earth with heaven through His humility and sacrifice on the Cross. For this reason, the Apostle Paul writes: ‘For he himself is our peace, who has made us both one and has broken down in his flesh the dividing wall of hostility…And he came and preached peace to you who were far off and peace to those who were near’ (Ephesians 2.14–17). The hymnographers of Christmas interpret in a prophetic insight the Mystery of Christ’s incarnation, which the Church treats as its high treasure in prayer, worship and theology. The Church celebrates joyfully these days and chants, ‘comprehending in awe the mystery O’ Lord, the angelic powers were astonished, as You condescended to become a child, You that adorned the stars with the pole and sat in the manger…’ as well as, ‘let us be exalted in Christ, narrating this great mystery’ (hymns of Christmas). The hymnographer thus expresses poetically those secretive occurrences, which took place inconspicuously, far from the eyes of the rulers of this world. Therefore, brothers in Christ, with sacred silence and grace, let us celebrate this year the Mystery of our salvation, for thus shall we experience those mysteries that the Prophets of Israel and the Sages of the ancient world saw ‘through the glass darkly’, while the faithful Christians have been experiencing them divinely for the last two millennia. May the Ruler of peace, Christ our true God, bring His peace ‘to those far and near.’ May He reconcile the people of all nations, and enlighten all of us to embody the letter and the spirit behind His teaching, He who ‘opened the heavens and descended on earth’ in order to introduce His Gospels to the world; for He ‘made Himself of no reputation, taking on the form of a servant, and coming in the likeness of men’ (Philippians 2.7). The hymnographer of Christmas also writes: ‘Thy Nativity, O Christ our God, shined the light of knowledge upon the world’ (dismissal hymn). 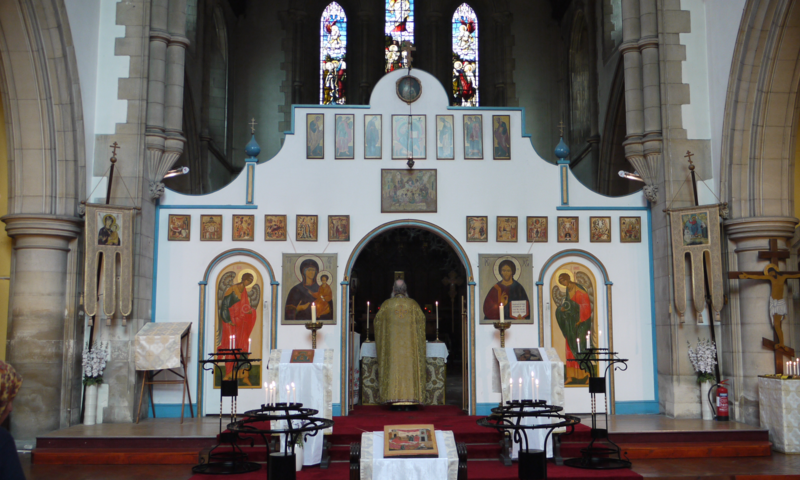 Therefore, brothers and sisters in Christ, being faithful to the orthodox Christian tradition, let us go to the Church these sacred and unique days and partake of Holy Communion. Let us forgive ourselves and one another, let us be charitable to the poor and the sick, let us pray in deep faith and humility, so that the God-man Christ may be formed and rekindled in us and around us. Let us beseech the Divine Child to remain with us ‘all the days of our transitional life’ and grant us His peace and the blessed hope of the Saints and of all those who, throughout the centuries, have experienced the Mystery of the Divine Economy. Praying and partaking in your joy of Christmas, of the New Year as well as of Theophany, I wish you health and the blessing of our Lord Jesus Christ upon your pursuits in the New Year 2018, and I remain with warm wishes and with love in the Lord and honour.